(Phys.org)—Scientists have proposed a new family of structures that are three-dimensional (3D) variations of graphene, the simplest example of which is called a "hyper-honeycomb." If the proposed structures can be experimentally realized, the new ways to arrange carbon atoms would add to the ever-growing number of new carbon allotropes. The scientists also predict that, among its interesting properties, the hyper-honeycomb could potentially be even more stable than diamond. The scientists, Kieran Mullen, Bruno Uchoa, and Daniel T. Glatzhofer at the University of Oklahoma, have published a paper on the proposed hyper-honeycomb and related structures in a recent issue of Physical Review Letters. Graphene is often described as having a honeycomb or chicken wire structure because it consists of carbon atoms arranged in a single-layer-thick hexagonal lattice. In this 2D structure, every carbon atom is connected to three other carbon atoms. The resulting "planar trigonal connectivity" contributes to graphene's unique properties, in particular its electrical properties that make it an excellent semiconductor. As the scientists explain, the trigonal connectivity of graphene produces something unusual: it causes the energy of an electron to vary linearly with momentum, which causes the electrons to mimic the behavior of electrons moving close to the speed of light. The momenta values at which this behavior occurs are called "Dirac points" after the Dirac equation that describes relativistic electrons. Most material structures, carbon or otherwise, do not contain Dirac points. This linear behavior strongly influences how the electrons behave, affecting their scattering and their interactions with vibrations in the lattice. 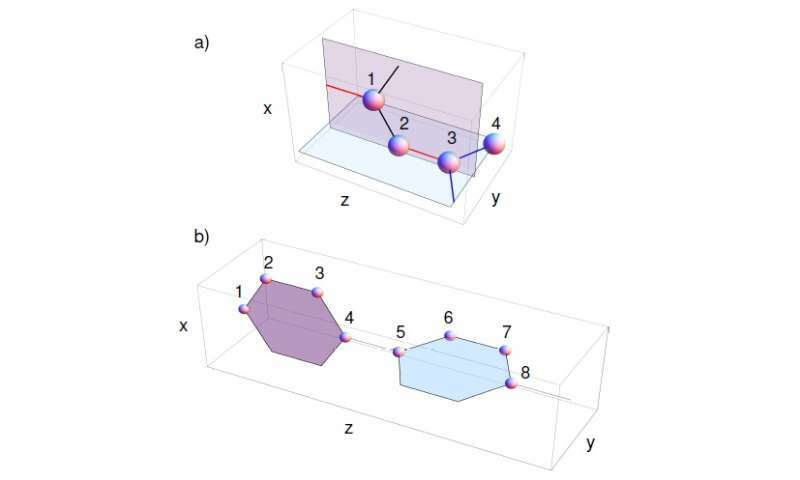 Here, the scientists investigated what happens when the Dirac points in a carbon-based planar trigonal structure are extended into three-dimensional space to form Dirac loops. Dirac loops are not as well understood as Dirac points because, unlike Dirac points which share similarities with relativistic electrons, Dirac loops do not have a relativistic analogue. To date, Dirac loops have never been experimentally observed, and have only been predicted to exist in a few finely tuned materials. The scientists' analysis revealed that Dirac loops can theoretically form when chains of trigonally connected carbon atoms are stacked perpendicular to each other. This arrangement differs from graphite, which is also a 3D form of graphene, but in graphite the layers of graphene are stacked on top of each other like a stack of paper. The proposed perpendicular-stacked chains could have many different dimensions due to the different possible combinations of vertical and horizontal honeycomb hexagons in the unit cell of each chain. For example, the simplest example, the hyper-honeycomb, consists of just two carbon atoms in each vertical and horizontal chain. With its vertical and horizontal layers, the hyper-honeycomb lattice somewhat resembles shelves in a tiny two-sided bookcase. "The significance of our work is two-fold," Mullen told Phys.org. "First, this is the first simple system to display Dirac loops. Dirac loops are a behavior not yet seen in electronic systems. The existence of such a loop would have strong effects on how electrons flow through the system and on how they behave in the presence of a magnetic field. "Second, the system leads to a host of related systems that would all have similar, unusual behavior. Some are other carbon structures, others are different physical systems (for example, an optical lattice of cold gas atoms) that are connected in a similar fashion. We may find further unusual behavior as we explore the 'zoo' of systems." As the scientists explained, the 3D structure may also make the hyper-honeycomb allotropes extremely stable—even moreso than diamond or graphite. "Stability can be tricky," Mullen said, referring to how stability is defined. "Diamond is stronger than graphite, but 'less stable' in that it is not the form of carbon with the lowest energy. It is 'meta-stable' in that you would have to wait an unbelievably long time before it would every spontaneously change! "We know that the H0 [hyper-honeycomb] structure is meta-stable—any small deformation of the structure raises the energy. We know that it would be difficult for the system to find a way to rearrange itself to any other lattice. We are trying to calculate the 'hardness' and 'strength.' Graphene is strong (it is hard to tear) by not hard (it can be stretched). We will know this summer more about the material properties." The scientists expect that synthesizing this new family of carbon allotropes will be challenging but possible with current technology. Synthesis might require doping carbon chains by substituting other atoms, such as thallium, for some of the carbon atoms in order to facilitate growing the proposed structures. Furthermore, even if these structures cannot be realized in carbon, they might be created in optical lattices of cold gas atoms, or perhaps in other nanostructures producing similar loops. "First, we will further explore the 'zoo' of these lattices," Mullen said. "This involves calculating their thermal conductivity, stiffness, yield strength, and magneto-conductivity. Second, we will go beyond this simple single-electron picture of these systems. Third, we will work with collaborators who want to synthesize these materials."